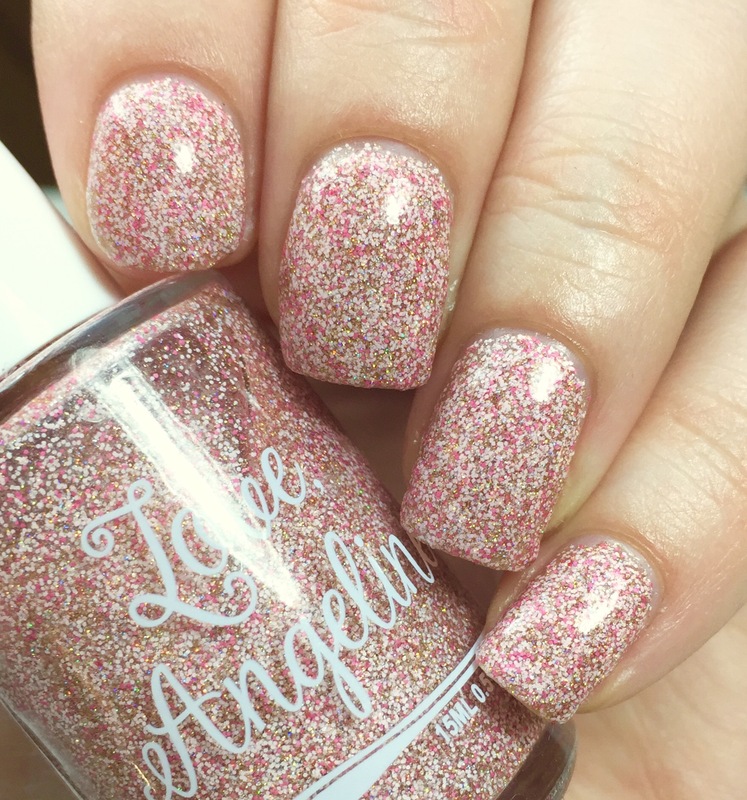 The recent sports-related accident (resulting in my dinky pointer nail) gives me an opportunity to swatch some things I’ve been holding on to, including this glitter pink mystery from Love Angeline. 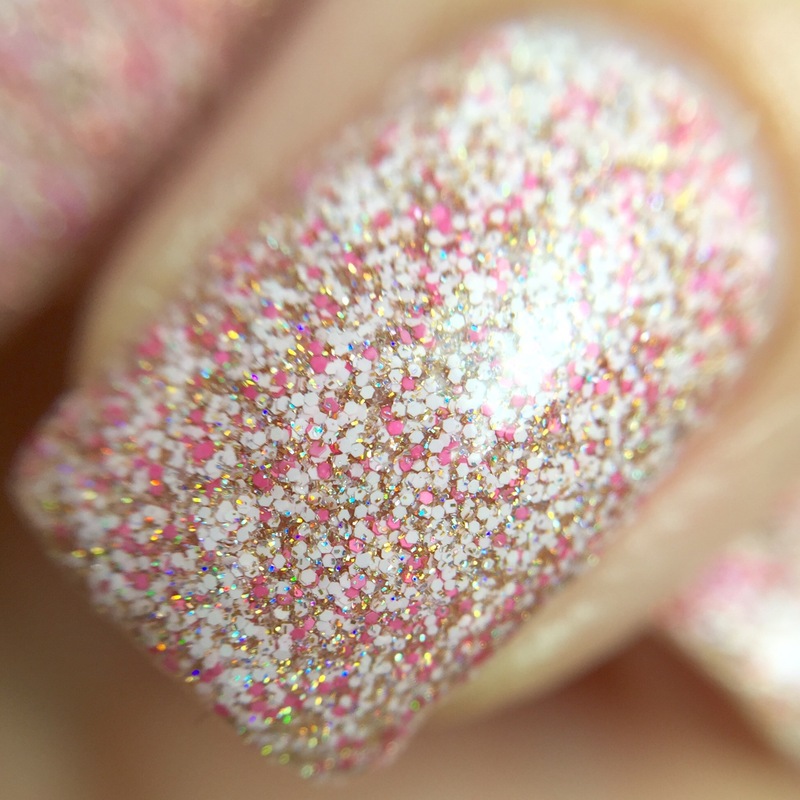 As you can see in the macro, this polish has pink and white microglitter in a clear base. There is also a bunch of holo particles, which give sort of a gold tone in the aggregate. It is totally opaque in two coats, although the gold-ish microflakes make it look like your nail might be showing through. After much deliberation (and experimenting with more coats on my other hand), I determined this was a polish illusion and it is totally opaque. The clear base dries down, which is nice with Tia kind of glitter-dense polish- otherwise it would be a goopy mess. As a result, you’ll definitely need too coat to smooth it out. I really like how fun this is up close- kind of like that sticky play sand you got to use as a kid. (A recent trip to the craft store tell me that stuff is still around.) But back your eyeballs up for a bit and this melds into a nice, subtle light pink. Dare I say…work appropriate? What a fantastic glitter combination! I don’t think I’ve seen one quite like this before, but I love it! Oooh, the combo of the gold, white, and pink is amazing! Absolutely beautiful! 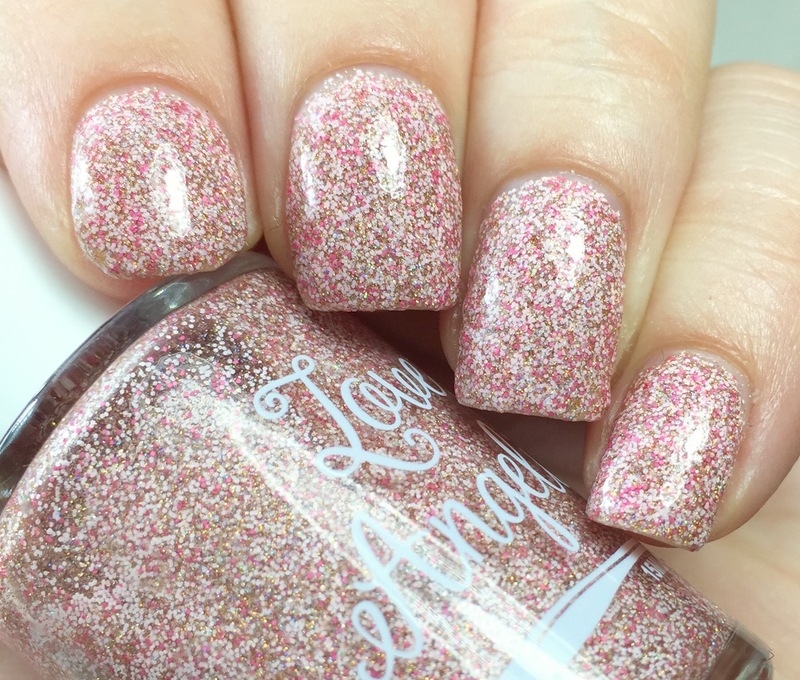 Love micro glitters! That definitely sounds like a fantastic deal on mystery polishes and you got a hella gem out of it too. I had a little shopping spree with Love Angeline and her clearance sale last week. Love her formulas. I have never tried this brand, but this polish is really lovely. That macro shot is amazing! You captured every detail in this polish. I’m not typically a fan of glitters like this, but I like how these colors go together. Very pretty.